Look, we’ve all been there. Sometimes, we just can’t be bothered with hanging that favorite shirt up properly; we know we’re going to wear it again soon anyway. Or it just seems like some miscellaneous item would be better of thrown into the closet and dealt with later. Closets just seem to get more and more cluttered over time, until one day you peer into your closet and wonder when you got to be so messy. Perhaps it is time for a closet reorganization. When organizing your closet, it’s not enough to just shift a few things around. You have to have a strategy before you embark on your task, or else your closet will return to its former clutter in no time. Start with this plan and see what works for you. By then, you’ll be a certified closet organizing pro! Make sure you have ample space to lay out the contents of your closet. The first step is a monumental one–take out everything in your closet. Clothes, hangars, shoes, blankets, and other miscellaneous items all need to come out. Be sure to have a music playlist running in the background to keep you company, and a mirror to see how some lesser-worn clothes look on you would be nice. Toss the smaller items that have shown up in the closet into a jar so that they don’t get accidentally added back into the closet later. Your closet is cluttered because you’ve got a lot of stuff you don’t need in there. Determine what are not essential closet items. Only your clothes, shoes, and perhaps your linens belong in your closet. If this means having extra space, that’s okay! Cluttered closets are always overfilled with extra items that don’t belong. Keep only the items you really need. This might be difficult, but chances are, if you haven’t worn an item in over a year, you probably aren’t going to wear it again. If you find yourself with lots of similar items, perhaps you do not need all of them. Try on some of your older items and see if they still fit. Take the items you no longer need to a consignment store, donate them to charity, or hold a garage sale. Most importantly, they no longer belong in your closet where they contribute to the clutter! Actually, clean the closet. Wipe down the walls and vacuum what you can. Lost items and stray trash often end up in the nooks and crannies of your closet, so pay attention. Return the items to your closet in an orderly way. Make sure you group together similar items and give your most-worn clothes the prime real estate in your closet. Novelty items like a fancy dress or tall stilettos don’t need to be accessed often, while your favorite shirt and most comfortable shoes should be placed in prominent places. Step back and admire your success. 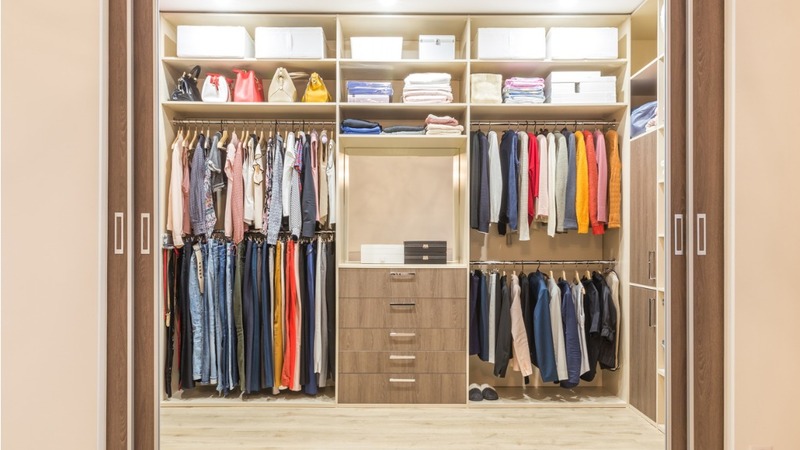 Your newly done closet should look more manageable and a lot cleaner. It’s tailored to your needs and now you know where everything is! Your closet is a big part of your life. If you’re like most people, you use your closet almost every morning. If choosing an outfit is the first thing that you do in the morning, you certainly want to be greeted by a clean and organized closet. It’s a sign of a good day when you’re picking your favorite outfit from your beautifully done closet. So don’t waste a moment and start reorganizing your closet! Have fun cleaning and enjoying your more streamlined closet design. Thanks for reading!